A boy with learning difficulties and a teenager who suffered a family tragedy were recruited and exploited by an unscrupulous Manchester drug gang to deal heroin and cocaine on Blackpool's streets. Kai Henderson, 20, of Castlecroft Road, Bury, and Jack Wakefield, 19, of no fixed abode, were set up with a £5,000 stash of cocaine and heroin stored in a room at the Adam and Eve hotel, Preston's Sessions House Court heard. In what is a typical 'County Lines' drug racket scenario, the boys, who were living in a hostel at the time, were driven to the Adam and Eve B and B in Blackpool and told to deal drugs for a wage of £30 a day. The pair were arrested on Bickerstaffe Street near Central Pier in November 2016 - when they were only 17 - with two known drug users. Prosecuting, Jeremy Grout-Smith said: " Police intervened before any transaction had taken place. Mr Wakefield had a knife, but not with an illegal blade, and also had three wraps of heroin and three of cocaine and a key for a hotel room. "The room was searched and police located their toothbrushes which yielded their DNA, and a subs quantity of drugs - 107 wraps of heroin, 253 wraps on crack cocaine - was found and valued at £5,500. "They were already wrapped and divided into packages." Incriminating text messages on a mobile phone made reference to a similar quantity of drugs to those found in the hotel. He added :" At the time Blackpool's drug trade was dominated by rogue criminal groups from Liverpool and Greater Manchester who use and employ dealers, put them up in hotels or flats where they operate from." 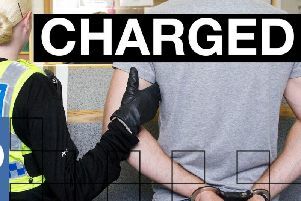 Both teenagers - neither of whom has previous convictions - admitted possessing cocaine and heroin with intent to supply. The court heard Henderson's childhood had been turbulent since his dad was killed by a car when he was a little boy - he had been holding his hand at the time of the accident as they crossed a road. Wakefield has a much younger mental age than he should due to serious learning and cognitive difficulties. Recorder Robert Lazarus said: " You had been brought to Blackpool from Manchester by persons unknown and were put up at the Adam and Eve hotel where effectively you set up a base of operations. "There is no evidence that you were anything other than a relatively naive recruit at the bottom end of a sophisticated network. Nonetheless you must've realised the seriousness of what you were involved in. "You are both lucky not to have had a prison term today. I would urge you to make good use of your time to move forward with your life and not offend again. " Henderson received two years suspended for 18 months while Wakefield got a community order with supervision, a rehabilitation activity and a tagged curfew.